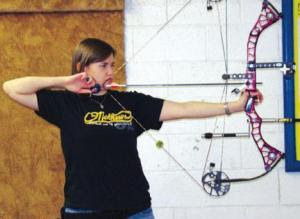 Becky Grube of Meyersdale is a dead eye archer and her sights are set on the 4-H National Shooting Sports Invitational. Becky advanced to the national contest after winning the women’s compound bow division at 4-H State Achievement Days this August. She placed third overall at the state competition. Becky has been shooting for the past six years, ever since she was 12. “I enjoyed it from the beginning because of the competition and there’s always something to learn about,” she said.